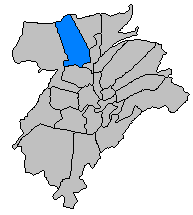 The Quarters of Luxembourg City (Luxembourgish: Quartierën, French: Quartiers, German: Stadtteile) are the smallest administrative division for local government in Luxembourg City, the capital and largest city in the Grand Duchy of Luxembourg. The 24 quarters of Luxembourg City vary in size greatly: a legacy of the historical expansion of the city limits. Quarters shaded by population. Greater population is reflected by darker shades of blue. ^ "Statisiques sur la Ville de Luxembourg: Etat de Population - 2018" (PDF). www.vdl.lu (in French). Ville de Luxembourg. Retrieved 29 January 2019. Kirchberg is a quarter in north-eastern Luxembourg City, in southern Luxembourg. It consists of a plateau overlooking the north-east of the historical city centre, Ville Haute, connected to the rest of the elevated city by the Grand Duchess Charlotte Bridge, which spans the Pfaffenthal valley. It is often referred to as the Kirchberg plateau, or simply, the Kirchberg by Luxembourg residents. Hamm is a quarter in eastern Luxembourg City, in southern Luxembourg. It is the home of the Luxembourg American Cemetery and Memorial, the final resting place of 5,076 American servicemen, including General Patton. Hollerich is a quarter in south-western Luxembourg City, in southern Luxembourg. Pfaffenthal is a quarter in central Luxembourg City, in southern Luxembourg. The village owes its name to the German words Pfaffen, meaning monk, and Tal, meaning valley, as the area was once administered by the Benedictine Abbey in Altmunster. During the Middle Ages, this site was popular for craftsmen and artisans, who used the Alzette River to aid in their work. The site is a strategically important gateway to Luxembourg City, and was thus repeatedly fortified by successive rulers from about the fourteenth to eighteenth centuries. Limpertsberg is a quarter in north-western Luxembourg City, in the centre of Luxembourg. Cessange is a quarter in south-western Luxembourg City, in southern Luxembourg. Grund is a quarter in central Luxembourg City, in southern Luxembourg. It is located in the valley below the centre of Luxembourg City on the banks of the Alzette River and, in addition to being a picturesque area, is a popular nightlife precinct which can be accessed by foot or via a lift which descends through the cliff. Clausen is a quarter in central Luxembourg City, in southern Luxembourg. Clausen is one of the oldest neighbourhoods in the city of Luxembourg with its earlier history tying back to that of the breweries in the area during the 12th century. It is now a hot spot for nightlife with a number of trendy bars and restaurants. Beggen is a quarter in northern Luxembourg City, in southern Luxembourg. As of 2018, the quarter has a population of 3,746. Gare is a quarter in central Luxembourg City, in southern Luxembourg. The quarter has, since 1859, been the location of Luxembourg's principal railway station and terminus, Luxembourg station, around which it subsequently developed. The quarter's name translates into English, from the French Gare, to "station". 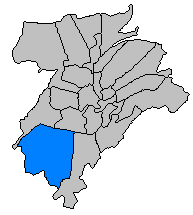 Mühlenbach is a quarter in north-western Luxembourg City, in southern Luxembourg. Belair is a quarter in western Luxembourg City, in southern Luxembourg. Ville Haute is a quarter in central Luxembourg City, in southern Luxembourg. It is the historical centre of Luxembourg City and is involved in its UNESCO World Heritage Site status. As of 2017, Ville Haute had a population of 3,500, with just less than a third being of Luxembourgish nationality, and 57.2% being of other European Union (EU) nationalities. North Bonnevoie-Verlorenkost is a quarter in southern Luxembourg City, in southern Luxembourg. Within the quarter lies some of the area of Bonnevoie, most of which lies in the quarter of South Bonnevoie. Luxembourg has only UNESCO World Heritage site and a further one on the tentative list.